This furry pet wig and tie, turns your cat into the President! Fits most average size cats and small dogs. Collar and tie attaches with velcro. High-quality Material - Made of cotton material, quite comfortable for your dog to wear and easy to put on or take off. 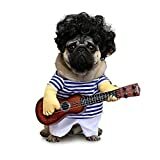 Guitar Player Cosplay - Perfect for Christmas, party, wedding, birthday, cosplay and daily use; suitable for small to medium breeds. Public Spotlight - Dogs can play guitar as a super star, which surely will get more attention and be the spotlight no matter where you are. Enhance Relationship - When your pet wears the guitar dog costume, it is so funny that you can relieve the pressure. And spend a wonderful time with your pet. Our size is different with US or international size. Please kindly check your pets measurements to make sure the item fits before ordering. 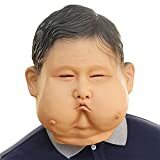 Halloween Costume Mask novelty and creepy but hilarious! Good stretch and surface tension, durable, easy to carry.Fit for Most teens and adults. Comfortable and breathable. See through the eye holes, the inside of the mask is large and allows plenty of room to breathe. Interesting Use: Suitable for Masquerade Parties, Costume Parties, Carnival, Christmas, Easter, Halloween,stage performances, craft decoration. Anyway, it will see plenty of use at times other than Halloween! DID WE MENTION EXCLUSIVE: This fantastic Presidential costume is exclusive and manufactured for us only, so we can guarantee the quality. SELF STUFF COSTUME: This costume is designed for you to self stuff the legs, use paper, towels or any other material to fill garment, takes 1min to stuff garment. 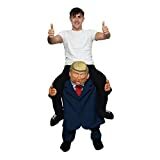 MORPH COSTUMES: The company behind Morphsuits, known for quality products, 1.3 million Facebook followers, sold over 2 million costumes, trading for 7 years, we manufacture this Piggyback costume. 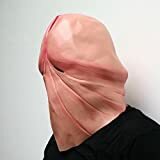 PREMIUM MATERIALS : The Halloween costume is made of 100% polyester that is strong and durable so that you will never have to worry about any tears or holes. We carefully check each product before shipping to make sure that it's flawless so you can receive it in top condition. 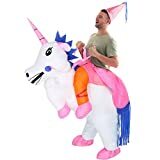 FANCY COSTUMES : Dress up as a big ballerina, gorilla, t-rex, or unicorn rider, a cowboy or a sumo wrestler, and draw everyone's attention on you! Perfect for Christmas, Halloween, Cosplay,Oktoberfest, Charity Fun Runs or just an ordinary day! Requires 4 x AA Batteries (not included); AA batteries to operate the blower for inflating. Air pump and blower is included. re-chargeable AA batteries are possible to use. Big hit in the crowds. Easy set up. Easy to move about. Easy to walk, jump, sit, run. Great fun. Detailed user manual is included. NOTE : Please tighten the outer ring to hold the fan in place before putting on the costume, in case the ring becomes loose during shippment then the fan would fall out; If the costume can't be fully inflated, pls loosen the ring and turn the fan towards the front to better inflate the head, also, tighten the drawstrings as tight as possible. 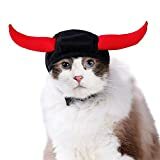 Cute cat bat costume: This cat Halloween costume is perfectly suitable for your cute pet to wear at a costume party, which makes your pet stand out. Give your cute cat a bat wing and create a fascinating back. Comfortable: This cat costume is made of black felt cloth, which is soft and comfortable for your pets. Easy to wear: This cat costume using chest and neck adjustable Velcro design, easy to put on and take off as well. This cat costume is good for cats of many sizes and little dog. Increasing festive atmosphere: The overall design of the product is black, with smooth and smooth lines. The mysterious cool feeling of bats is very vivid. Note：Please measure your loved cat's neck girth, chest girth before placing the order. If have any questions on PEDOMUS Cat Bat Costume, please CONTACT US! We will solve your problems within 24 hours. Best Gift for Xmas/ New Year/Daily Party/Cosplay Event.The item is shipped from Amazon warehouse,you will receive it on second day. Made of high density polyester,Adult size fits for all 150-190cm,Child size fits for all 90-150CM,If your height is 150CM,we suggest you could pick the Adult size. 100% brand new with handmade,Waterproof, Lightweight.Easy to blow up,Requires 4 x AA Batteries(No included).